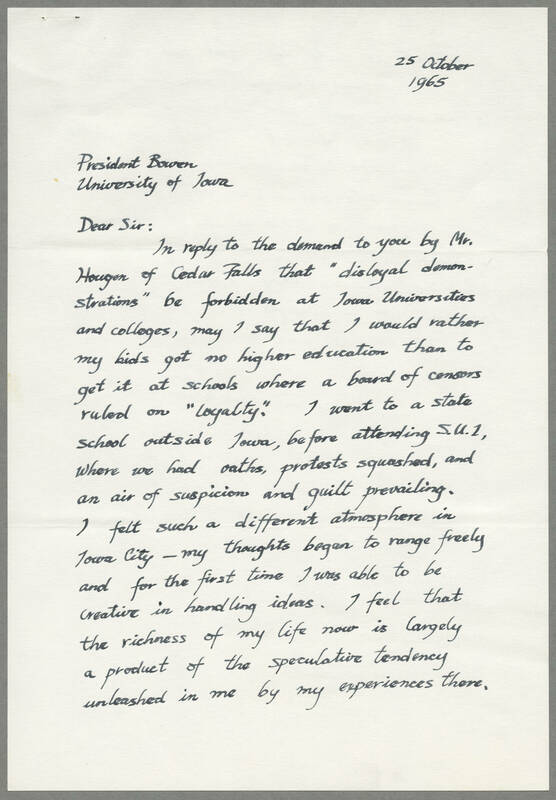 25 October 1965 President Bowen University of Iowa Dear sir: In reply to the demand to you by Mr. Hougen of Cedar Falls that "disloyal demon-strations" be forbidden at Iowa Universities and colleges, may I say that I would rather my kids got no higher education that to get it at schools where a board of censors ruled on "loyalty." I went to a state school outside Iowa, before attending S.U.I, where we had oaths, protests squashed, and an air of suspicion and guilt prevailing. I felt such a different atmosphere in Iowa City- my thoughts began to range freely and for the first time I was able to be creative in handling ideas. I feel that the richness of my life now is largely a product of the speculative tendency unleashed in me by my experiences there.